Diane Barnes in her DeBartolo Hall office. There hasn’t been a lot of down time in Diane Barnes’ work lately – just take a look at her vita (more on that later). But, if there was time to curl up on the couch with a book, it’d be a detective novel. Barnes has been doing a lot of detective work lately. Last month, her latest book – a digital, college-level history textbook – was published by Bridgepoint Education, which estimates that more than 50,000 college students will use the book every year. It’s her fifth book in seven years – in 2012 and 2013, she authored volumes on 19th century African American activist Frederick Douglass, in 2011 she co-edited a collection of scholarly essays and in 2008 she wrote a monograph based on her graduate study dissertation at West Virginia University. All of that on top of being editor of the Ohio History journal, associate editor of the Frederick Douglass Papers, co-editor of a monograph series on law, society and politics in the Midwest and development editor of Oxford University Press’ African American National Biography, not to mention a slew of peer-reviewed book chapters, journal articles, book reviews and presentations/lectures from New Orleans and St. Louis to Great Britain and Canada. And she’s loving every minute of it. She thought she’d become a Civil War historian, but – while earning master’s and PhD degrees at WVU – her focus settled more broadly on 19th century American history. Barnes, however, will always be particularly tied to Frederick Douglass, a former slave, newspaper editor, statesman, abolitionist and the most famous African American of his time. 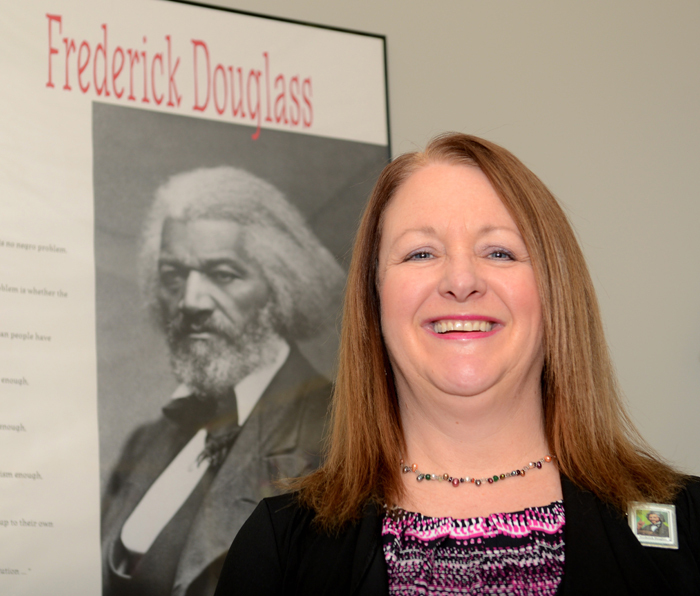 “I guess you could say he’s my guy,” Barnes said, noting the Douglass posters on the walls of her office in DeBartolo Hall. “He’s a fascinating person. What’s next? She has a contract to edit a book in Ohio University Press’ “Civil War in the Great Interior” series. And, she said she’s ready to dive head first into a project to research more than 800 letters and documents left by the Sutliffs, a pioneer family in Trumbull County who were leaders of the abolition and Underground Railroad movements. But, right for this moment? “Well, for now, my husband is just glad to have me around so I can go to the grocery store and pick up the dry cleaning,” she said.